I have experienced mental illness in several forms in my life and I have been in treatment, and now recovery, for many years now. I understand how isolating and hopeless mental ill-health can feel and how difficult and daunting seeking help can be. 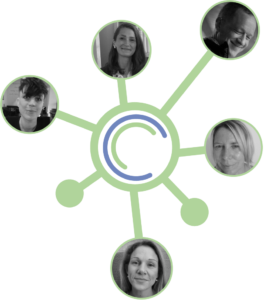 My role within the Care Collective is to provide you with support around the challenges you are experiencing, whether this be practical, social, emotional or environmental. Therapy has been fundamental in my growing ability to contemplate and make change happen, but it isn’t often easy and I know that I needed another type of help to stay connected to my goals and to engage with some of the more practical aspects of changing my thinking and behaviour. My aims as a Support Worker are to help you to feel heard, understood and safe. I hope that in sharing some of my own experiences and insight I may help you feel less alone and hopeful that things can improve. I have worked in the NHS for 23 years: in all kinds of mental health settings, with all kinds of people. Having originally trained in Mental Health Nursing, I qualified as a Cognitive Analytic Therapist (CAT) 8 years ago. I am also an accredited CAT supervisor. For the past 5 years I have worked as a Psychological Therapist in both an NHS Eating Disorders and Trauma Specialist services. Previously I completed a degree in English Literature, travelled and worked in residential support for adults with learning difficulties. Beyond work I also enjoy the company of all kinds of people: singing, dancing, wild swimming, and laughing when I can. My heart belongs to the founding principles of the NHS. So I’m glad to combine the ethics of a Social Enterprise with the time to offer skilled, kind and collaborative care. I am a BABCP accredited Cognitive Behavioural Psychotherapist and NHS/NES approved Clinical Supervisor, with over 20 years of experience delivering mental health care in the UK, Australia & Asia. I have specialist expertise and interests in perinatal mental health issues such as pre and post-natal depression and anxiety (parents with babies are welcome to these sessions), eating disorders, low self-esteem, substance misuse and addictions, anxiety disorders (panics, phobias, post-traumatic stress disorder, social anxiety) and depression, as well as general life concerns. I am passionate about the benefits that cognitive behavioural therapy can bring and believe that everyone should have access to compassionate, ethical & quality care at a time when they need it most. Through the Mental Health Care Collective I’m proud to be able to deliver care in an organisation that shares these values. I’m a Psychiatrist and a Psychotherapist, which means I’m a doctor trained in mental health and specialising in ‘talking therapies’. I have 20 years’ experience of mental health care in the NHS, working a lot with people with Eating Disorders. I have experience and training in therapy for people with Personality Disorders, Psychosis, Anxiety Disorders and Depression. I can advise GP’s on prescribing medication for mental health problems. The types of therapy I use are Cognitive-behavioural Therapy (CBT) and Schema Therapy (ST). I’ve done a bit of research, which you can look up here if you want to. Making you feel comfortable and developing a real connection with you is what I’ll be aiming for. I have past experience myself of mental health problems and recognise how difficult it can be to get help. I am the founder member of the Care Collective, as I want to contribute to making mental health care more accessible. It’s important to me to do this as fairly as we can, to charge fees to those who can afford it and reduced rate fees to those who can’t. Cycling is also a big thing in my life – sometimes too much for my own good! I am Senior National Officer in Scotland for Beat, the UK’s eating disorders charity. I co-ordinate the education, advocacy and campaigns work in Scotland, managing a team of Ambassador volunteers. I collaborate actively with other organisations. I am a Winston Churchill Research Fellow in Mental Health – I travelled across the USA and Canada investigating comparable and best practice evidence based approaches to eating disorders treatment, education programmes and stigma reduction initiatives. I also work with See Me, the Scottish Mental Health anti-stigma organisation. I am passionate about equality for all and am a graduate of the Scottish Parliament & YWCA Young Women’s Leadership Programme. Most importantly, I come from a place of lived experience in overcoming Anorexia Nervosa and navigating recovery from depression, anxiety and OCD, before entering the professional mental health field. I believe my personal experience provides me with a deep level of insight and empathy, and I am a strong advocate of peer support working in recovery. I’m hugely dedicated to helping others and for improved recognition, awareness and provision for those affected by mental health challenges.